Since the 1960s, WPC has conserved more than 3,840 acres of lands now protected permanently from development in the French Creek watershed and 3,800 acres along four miles of coastline along Lake Erie. Most recently, the Conservancy expanded the David M. Roderick Wildlife Reserve, and protected a key forested property along French Creek to help its owners continue sustainable forestry practices. This issue will also highlight how the Conservancy’s Natural Heritage staff is working with others to help restore the natural habitat of Erie Bluffs State Park, and how dedicated stewards keep the community gardens in Erie and Meadville vibrant. Thanks to Conservancy members, volunteers and community partners in Northwestern Pennsylvania, we are privileged to be a part of the efforts to ensure that the French Creek watershed and Lake Erie shoreline continue to thrive as ecological and recreational treasures. Pittsburgh, Pa. – May 21, 2012 – The Western Pennsylvania Conservancy (WPC) has acquired 92 acres with exceptional recreational and conservation value in Girard Township, Erie County. The property, purchased from Fairview Evergreen Nurseries, Inc., includes access to Elk Creek, a high quality stream recognized for its world-class steelhead fishing. The property has frontage along Elk Creek and is near Erie Bluffs State Park, for which the Conservancy secured land in 2004. This property will be open to the public for fishing and passive recreation. Conservation of this land will play an important role in maintaining wetlands and forest cover that help protect the creek’s water quality and habitat. This section of Elk Creek is also known to provide habitat for a number of bird species including the bald eagle. Elk Creek is the most popular steelhead tributary in Pennsylvania’s Lake Erie watershed, according to the Pennsylvania Fish and Boat Commission. The property falls within the Lower Elk Creek Natural Heritage Area (NHA). The globally rare rapids clubtail dragonfly and several other plant and animal species of concern have been identified within this NHA. WPC plans to relocate public access to the creek away from the active railroad corridor on the western side of the property to a trail through the interior portion of the property. Parking is available along North Creek Road. The Hetz family has owned the property for more than 100 years, and operated it as part of Fairview Evergreen Nurseries. The family will reinvest the proceeds from the sale into their business while also conserving land that was no longer viable for nursery production. Funding for this acquisition was provided by a grant from the Atlantic Coast Joint Venture Great Lakes Restoration Initiative, the Pennsylvania Fish and Boat Commission’s Erie Access Improvement Program and the Richard King Mellon Foundation. 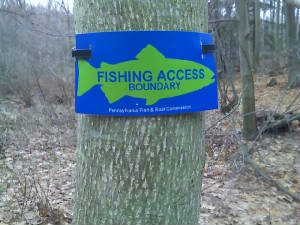 Local support was provided by the Lake Erie Region Conservancy and the Pennsylvania Sea Grant. The Western Pennsylvania Conservancy (WPC) enhances the region’s quality of life by protecting and restoring exceptional places. A private nonprofit conservation organization founded in 1932, WPC has helped to establish ten state parks, conserved more than 232,000 acres of natural lands and protected or restored more than 1,500 miles of rivers and streams. The Conservancy owns and operates Fallingwater, which symbolizes people living in harmony with nature. In addition, WPC enriches our region’s cities and towns through 140 community gardens and greenspaces that are planted with the help of 13,000 volunteers. The work of the Western Pennsylvania Conservancy is accomplished through the support of more than 11,000 members. For more information, visit WaterLandLife.org.